DHCP Lease Time – What is it and How does it work? The DHCP Lease Time, an important part of the DHCP settings. But what is it, how long should you set it or can you leave it on the default settings? In this article, I will explain how it works and what the recommend settings are for your network. Every network has it, a DHCP Server. It may be built into your router or you have a server that is handling the DHCP Leases. Without it, you would have to assign every network device (computer, mobile phone, network printer) manually an IP Address. A DHCP server does this task automatically for you ensuring that every device gets a unique IP Address to connect to the network. Now that address is leased to the client for a specific amount of time, the DHCP Lease Time. 1 What is DHCP Lease Time? 1.1 How does DHCP Lease Work? 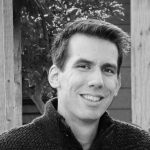 What is DHCP Lease Time? In sort, DHCP Lease Time is the amount of time in minutes or seconds a network device can use an IP Address in a network. The IP Address is reserved for that device until the reservation expires. For computers, and other network device, to communicate on a network they need a unique IP Address. You can compare an Ip Address to the postal address of your house. There can’t be houses with the same address, otherwise your mail might be delivered to the wrong house. IP Addresses work the same way and in a network, a DHCP server is responsible for assigning every device a unique address. The Lease Time indicates how long a device is allowed to use that IP Address. Now, this is important because the amount of available IP Addresses is limited in a network. For a typical home network, you have a DHCP Pool of 200 Ip Addresses. How does DHCP Lease Work? Before we go into detail what the optimal DHCP lease time is, lets first look into how DHCP Lease works. When your computer powers up it doesn’t have an IP Address so it will need to communicate with the DHCP server for an IP Address. If the computer doesn’t have a reservation yet for an address it will begin a new lease of the IP Address. But when it already has an active lease standing out, then it will confirm the availability of it and resume the lease. 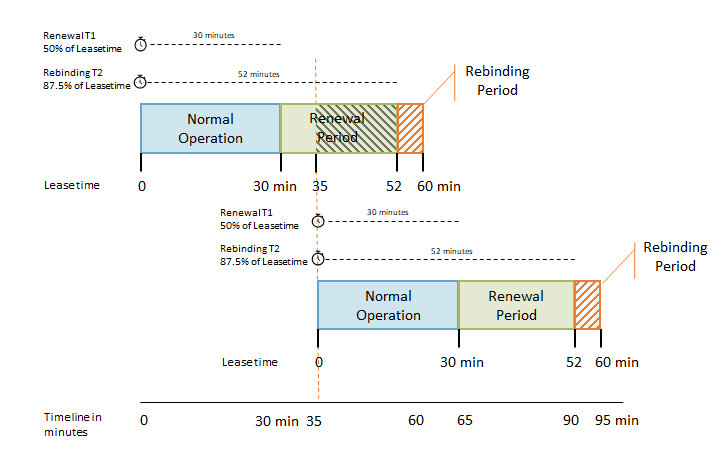 Every DHCP lease life cycle will follow a specific pattern, it starts with the initial lease, a normal operation period, a renewal period and if the renewal fails a rebinding period. Half way the leasetime it will try to renew the lease so it can keep the same IP address. If renewing failed (DHCP server is offline for example), it will try to extend the current lease with any active DHCP Server. Now let’s say you have set the lease time to 8 days (pretty long, but common in an enterprise network for wired devices). After 4 days the network device will try to renew the lease. At they 5 it is able to contact the DHCP server and renew the current lease. At that point the DHCP Lease life cycle will start over, so the timers (T1 and T2) will reset and the lease if valid for another 8 days. 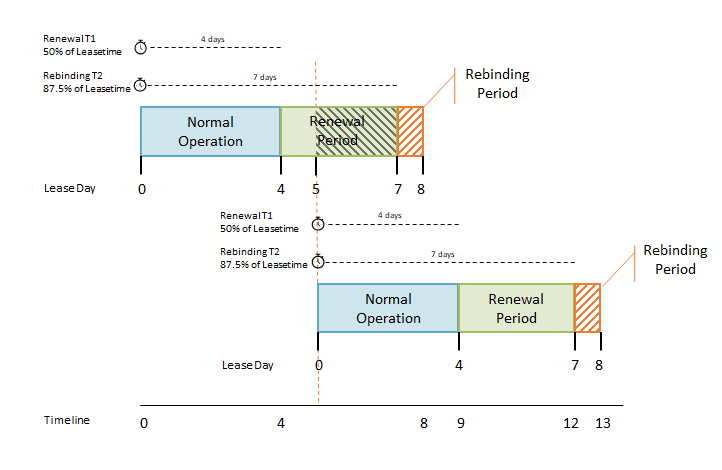 For wired devices, a lease time of 8 days is a typical period. Wired devices won’t leave the network often, so there is no reason to create a shorter period. A shorter period only increases the DHCP-related network traffic. Wireless devices tend to leave the network pretty often and can stay away for a couple of days. So a smaller lease of 24 hours is pretty common. This way regular devices will keep mostly the same IP Address. For guest networks and hotspots, you want a short lease time. Hotspots an hour max, while for Office guest networks 8 hours will work fine. Always make sure 20% of the DHCP pool remain available. To calculate the potential amount of devices in the network and add 20%. Increase the pool size or lower the DHCP Lease Time to make it fit. For a home network, the default 24 hour (1440 minutes or 86400 seconds) is fine. The amount of devices in a home network is limited, maybe up to 3 per household member where your pool of IP addresses is around the 200 addresses. But a higher lease time of 8 days would work evenly good. The reason is simple, the amount of network devices in a home network is pretty much static. The occasinal quest won’t be a problem with the amount of available IP Addresses. The problem with guest networks and hotspots is that you will have a lot of devices that are connected for only a short amount of time and then leaving. They might never come back, so there is no reason for a high lease time. But don’t want to set it to low, because this will only create a lot of DHCP-Related traffic. So first you need to know how much IP Address you have available and how much visitors you expect per day or per hour. If you have a coffee bar and you get 400 visitors a day. They stay on average 30 to 60 minutes and you have a DHCP Pool of 200 IP Address (192.168.0.10 – 192.168.0.210 for example). When you leave the DHCP Lease Time on the default 24 hours (1440 minutes) after 200 guest no other guest can use the free wifi network. Because all the 200 IP Address are reserved for the first 200 guests. With a lease time one hour, the client will try to renew the lease after 30 minutes. At 35 min it contacts the DHCP server to extend/renew the lease. It’s granted so the timers reset, a new lease is acquired for another 60 minutes. In total the IP Address is reserved for 95 minutes. With 200 address available you can have 130 guests per hour on avarage on your network. Permanent devices in a network can have a fixed IP Address. This is useful if you have to set Port Forwarding to a device or if you need to manage the device. Typically network devices like, routers, switches and network printers have a fixed or static IP Address. If you leave a printer on DHCP mode, it might get a new IP Address if you turn it on after a long time of period (after a holiday for example). If this happens you might have to re-install the printer on your computer, because your computer doesn’t know anymore where to find the printer. So always leave some room in your DHCP Pool for fixed network devices. Typically you start the DHCP Pool at 192.168.0.10 and let it end at 192.168.0.200. This leave you with enough room for the static Ip Address. (So you can assign your printer the IP Address 192.168.0.201 for example). For home networks you don’t have to change the DHCP Lease time. Just leave it on default and you wil be fine. Small Offices, Corporate Networks and Guest Networks on the other hand will need some planning when settings up the DHCP Server. Also make sure to take a look into DNS Scavenging when you are settings up DHCP and DNS servers in an enterprise network.